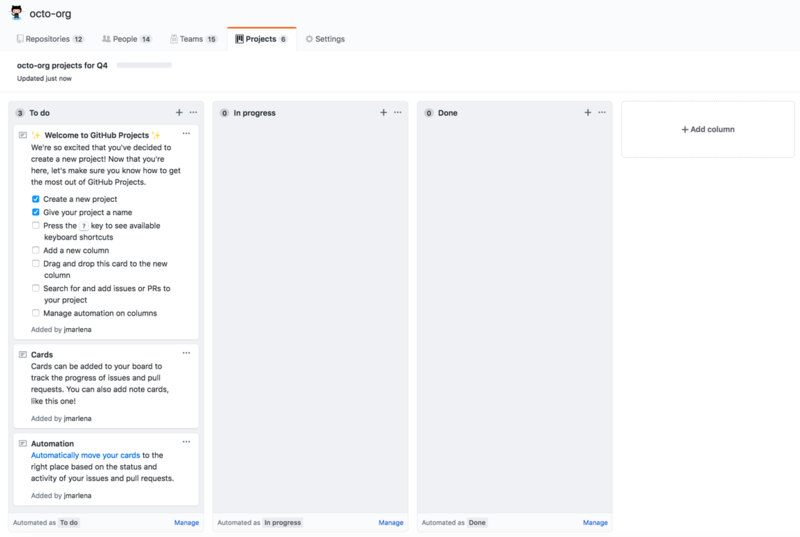 Project boards on GitHub Enterprise help you organize and prioritize your work. You can create project boards for specific feature work, comprehensive roadmaps, or even release checklists. With project boards, you have the flexibility to create customized workflows that suit your needs. You can create notes within columns to serve as task reminders, references to issues and pull requests from any repository on GitHub Enterprise, or to add information related to the project board. You can create a reference card for another project board by adding a link to a note. If the note isn&apos;t sufficient for your needs, you can convert it to an issue. For more information on converting project board notes to issues, see "Adding notes to a project board." Organization-wide project boards can contain issues and pull requests from any repository that belongs to an organization. You can link up to five repositories to your organization or user-owned project board. Linking repositories makes it easier to add issues and pull requests from those repositories to your project board using Add cards. For more information, see "Linking a repository to a project board."